"Brought out in January, 1896, as the Kinetic Lantern, this term was abandoned the following March in favour of the name Kineopticon. Being called to give an entertainment before the Prince of Wales in July, the inventor found, to his surprise, that the programmes issued under Royal auspices referred to his invention as the Cinematoscope. What could a loyal photographer do except follow the same course as Mr. Acres actually did? Cinematoscope it was by Royal dictum, and Cinematoscope it remains to this day. But as "a rose by any other name would smell as sweet", so has the Cinematoscope retained its good qualities under all its varied nomenclature." From "Living Pictures, Their History, Photo-Production and Practical Working" by Henry V. Hopwood, London 1899. Birt Acres, inventor of the first British 35 mm moving picture camera, the first daylight loading home movie camera and projector, Birtac, was the first travelling newsreel reporter in international film history and the first European film maker who had his films shown in the United States in public performances. For many years, Birt Acres' pioneering achievements seem to have been forgotten. Several of his successes have been credited to other pioneers, yet he was one of Britain's most important film pioneers. He contributed much to the introduction and development of cinematography in all its aspects, from the construction of cameras, projectors, film viewers, coating- and slitting machines and the manufacture of highly sensitized 35 mm raw film stock, to mobile newsreel reporting and the public projections of moving pictures. 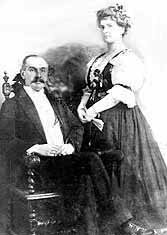 Birt Acres was born of British parents on 23 July 1854 in Richmond, Virginia but at some time prior to the Civil War the family moved to North Carolina where they started a tobacco and cotton plantation. They were caught up in the turmoil of the Civil War when General Sherman began his march through the Carolinas. The young Birt Acres was sent away to Richmond, Virginia, to stay with a wealthy maiden aunt while his parents remained to protect the plantation. Tragically, they were both killed and their home was burnt down. Birt Acres lost his parents and his home at the age of ten and he would never speak about anything before that time except that his father's name was John and that his mother had lovely hands and played the harp. Birt was adopted by his aunt who ensured that he continued with his education. She sent him to Paris to study art and science. When he returned he was ribbed by his friends for living of the charity of his aunt. To prove his independance he bought himself a horse and a gun and headed out across the Dakotas to lead the life of a Frontiersman trading with Sioux indians and learning two of their languages. In time he made his way up to Alaska taking occasional work in lumber camps and eventually he made enough money to go to Britain, his parents' homeland. - 1889 Apparatus for washing prints (patented). - 1891 Printing process for stereoscopic photograhps (for continuously contact print making) (patented). - 1895 Kinetic Camera with appliance for loop forming (patented). - 1895/96 Electroscope, apparatus for continuous viewing by more than one spectator of 35 film. - 1896 Installation for wholesale production of raw stock 35 mm film. - 1896 Kineopticon, improved apparatus for projecting 35 mm film (patented). - 1897 Cine camera with 2 lenses to resolve flicker problems and to enhance brightness. - 1898 Birtac, home movie camera for daylight loading of 17,5 mm film (patented). Whilst in Paris Birt Acres had become fascinated with moving images and tried to improve on the Zoetrope by replacing the pictures with photos which he took with a multi-lens camera. When he came to Britain, he took up portrait photography but never lost the dream of creating moving pictures. He was an enthusiastic photographer and also had a serious interest in the chemical side of photography, always trying to upgrade the sensitivity of photographic emulsions without losing quality of definition. He studied all aspects of photography and became a recognized expert giving lectures and writing articles for photographic journals. In 1890 he married Annie Cash, whose brother Edward, under his tutorship became one of the first travelling cameramen in India. 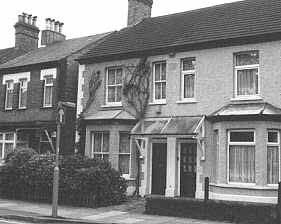 Probably, the young couple lived for a while with Annie's family close to Hackney in North-East London. In 1892, he became manager of Elliott and Sons Ltd, manufacturers of the famous Barnet Dry Plates. The couple moved to Barnet, living in Clovelly Cottage, the managers house next to the factory. Mechanism of Birt Acres' "Kineopticon" of 1895, now displayed in the Science Museum, Londen. 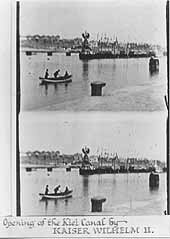 In 1893 Birt Acres registered a patent on a hopper feed arrangement with which he could take and project successfully a sequential series of photographs, - for instance, of a drifting cloud or a wave breaking on the shore. He used the rapid feed arrangement with a biunial lantern and it enabled him to create the 'distinct impression of motion'. He also registered patents for other photographic inventions eventually leading to the patenting of Britain's first (one of Europe's first) successful cinematograph camera, the Kineopticon, in 1896. 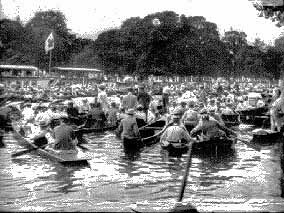 In 1894, experimenting with celluloid as a logical step from the successive glass plate photographs, he produced a short film, The Henley Royal Regatta of 1894 using an experimental camera and 70mm Kodak film that was generally available for snapshot cameras. A portion of this early film is in the Museum of Modern Art in New York. Birt Acres, using his portable cinematograph camera, was ahead of his competitor film pioneers in Europe with his film shows and his roving newsreel expeditions. His first successful 35mm film has been called by film historians 'Incident outside Clovelly Cottage'. Part of the film shows Acres' wife Annie pushing a baby in a pram past the front of the house. The baby was their son, Sidney Birt Acres, father of Alan B. Acres. 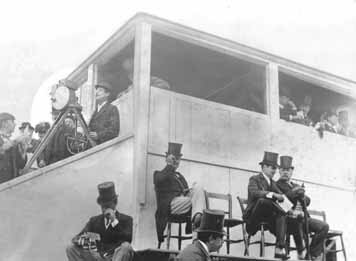 Birt Acres began to build a portfolio of 35mm films which included 'The Henley Royal Regatta of 1895 and the University Boat Race of 1895. Early in 1895 he made a contract with the international chocolate manufacturer Ludwig Stollwerck of Cologne, who exploited Edison's Kinetoscopes in Germany and other countries for which he needed a regular supply of film subjects. In June 1895, Stollwerck invited Birt Acres to film the opening of the Kiel Canal in Germany. Acres made trips to Hamburg, Kiel and Berlin where he filmed the opening ceremony, which was performed by the Kaiser; a review of the troops; later on a visit to Berlin, a charge of German Lancers and finally, the Kaiser leading a procession through the streets of Berlin. The following year, Birt Acres' pictures KAISER WILHELM REVIEWING HIS TROOPS and OPENING OF THE KlEL CANAL, together with his successful ROUGH SEA AT DOVER, were amongst Edison's films in the famous first film show of April 1896 in Koster & Bial's Music Hall. Ludwig Stollwerck was still a friend of the family at the outbreak of the First World War when they lost touch with each other. In August 1895, he gave his first semi-public film show at the Assembly Rooms in New Barnet, but it was not until the beginning of 1896 that Birt Acres felt confident enough to give a public exhibition of his 'animated photography', as it was then called. He showed his films to the Lyonsdown Amateur Photographic Association in Barnet Oil the 10th of January. This was certamly the first successful screen projection of films in England. In January 1896, almost at the same time as the Lumieres gave their first film show in London, he gave a public show before a meeting of the Royal Photographic Society, of which he was a member. 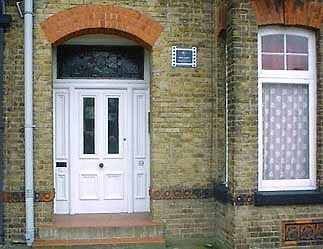 Salisbury Road 45, Barnet, where Britain's first moving picture company, The Northern Photographic Works, was established. Early in 1895, in order to avoid a conflict of interests, Birt Acres, becoming one of the first specialized manufacturers of 35 mm raw film stock, left Elliott's and established his own company, The Northern Photographic Works, first at 45 Salisbury Road, later as a limited company at Nesbitts Alley, Barnet, where he developed his improved film projector Kineopticon. Commissioned by the German company Stollwerck Bros he designed a viewing machine, the Electroscope, which had a built-in screen and was able to project two films alternately upon successive coins being inserted. The films could be seen by a group of people. He manufactured hundreds of films for the Kinetoscopes in England and Germany. At the request of the Cardiff Photographic Society, Birt Acres presented several of his films at the prestigious Cardiff Exhibition in June 1896. While he was there he filmed the visit to the exhibition of the Prince and Princess of Wales. Later, in seeking permission from the Prince to exhibit these films, he was requested to come to Marlborough House and demonstrate his films before 75 members of the Royal Families of Europe. This collection of notables would be attending the wedding of Princess Maud and Prince Charles of Denmark on 21st July 1896. This, the first ever Royal Command Film Performance, was almost certainly the highlight of Birt Acres' career. The story does not end here. Birt Acres went on to design an improved cinematograph system which he patented in April 1897 eliminating the jerkiness that was present in his earlier system. He never lost his enthusiasm for breaking new ground in his chosen field and in June 1898 he patented an apparatus for taking and projecting films for the home enthusiast. This was the Birtac home cinema, designed specifically according to the handbook, to place animated photography within the reach of everyone and which used 35mm film split lengthways. Birt Acres not only trained his brother-in-law Edward Cash but also others to become film pioneers in their own right, among them Henry Short and most notably Arthur Melbourne-Cooper (1874-1961) who established his own film production company, the Alpha Trading Company. When the film industry became a booming business, Birt Acres expanded his activities and the Northern Photographic Works became the Whetstone Photographic Works Ltd., moving at the same time to much bigger premises at Whetstone. Alan Acres and his son Kevin have written a biography about their grandfather. 350 pages and well illustrated. As he was completing the book for publication he got news that a number of Birt Acres films, over 100 years old, had been found with an old fairground family. These have been restored and were premiered at the Silent Film Festival in Sacile, Italy.